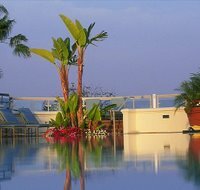 The spa and fitness center at the Four Seasons Resort Aviara holds 25 treatment rooms including a Couple's Suite with side-by-side massage tables, a lounge with marble fireplace and double shower, and a private patio with whirlpool. There's also a Zen garden with five outdoor massage cabanas. Facilities include a fitness center with machines and free weights, plus an indoor solarium with fireplace whirlpools. The spa offers a full menu of massages, scrubs, body wraps, facials, and bath rituals. Indigenous Southern California treatments include a hydrating avocado body wrap. There's also a José Eber Salon on the premises offering a range of hair, skin-care, and nail services.